Happy Christmas from everyone at Rock Out! We hope you have a rock n' roll Christmas and a very happy New Year from everyone at Rock Out! The schools have now closed for the Christmas period, but we are up back up and rolling again on January the 7th. Rockout! Alton back up and rolling for the new term! Rockout! Alton school are back up and rolling for the new term! Starting with the Only One's classic - Another girl another planet! Rock Out! 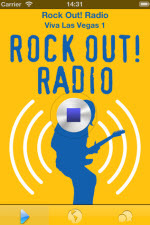 has launched it's very own internet radio station, Rock Out! Radio. Now you can listen to awesome classic rock tracks 24 hours a day, 7 days a week as well as exclusive interviews and content produced just for us. Keep checking back for an update schedule of programmes. You can even grab the player and leave it on your desktop or include the code on another site! See us at Sun Hill this Saturday! Rock Out! is thrilled to have been asked to be at the Sun Hill Barbeque this Saturday 22nd September. Come along and see us. Well the Facebook page is finally up so please visit for the latest photos, videos and who's up to what. Like us too!